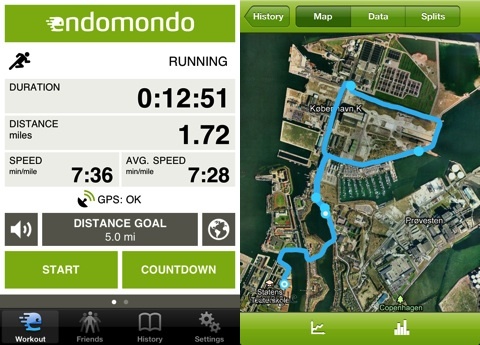 The Endomondo app for iPhone is a great, solid option for easily tracking your fitness activities. The Endomondo iOS app has a social community that you can opt into as well, and you can also monitor your history and progress online at endomondo.com. The set-up for the Endomondo iPhone app is quick and easy, so you can spend more time burning calories. You can sign in through your Facebook account, or you can create an account using your email. You are instantly transported to the visually-appealing, well-organized Endomondo iOS app home screen. The graphics are modern, bright, and large enough to see clearly when you’re working out. Frequently, fitness iOS apps will clutter the screen. The important, relevant items related to your work-out fill the screen. You navigate to your friends, history, and settings via a menu bar at the bottom of the screen. The most successful aspect of the Endomondo iPhone app is the intuitive interface for monitoring an activity. The information you need to adjust is gesture controlled and logical. The important aspects to monitor are organized in horizontal bars on the screen. If you want to change the type of activity, you touch the top bar, scroll through the list, and tap it. The duration, distance, calories, and heart rate (if you have compatible heart rate monitoring equipment purchased at endomondo.com) are neatly organized for you to monitor. During your activity, a voice lets you know distance and pace. The default workout for the Endomondo iPhone app just lets you hit start, and it immediately begins tracking duration, distance, and calories for running and walking. You may also adjust to a different workout where you set a goal, find a route, compete against a friend, or compete in an Endomondo sponsored competition with just a couple of touches on the screen. The social aspect of the Endomondo iPhone app is fairly straightforward. You can monitor your friends progress and routes in a news feed accessed via the friends icon at the bottom of the screen. You may also share your progress to Facebook. The Endomondo iPhone app has a nice surprise as well in your workout history. Using gesture controls, you can check out your map, data, and splits. The detail is excellent and includes distance, duration, average speed, max speed, calories, altitude, elevation, and your heart rate. For $3.99, you can upgrade to Endomondo PRO and receive enhanced report details and customized progress plans. The Endomondo iPhone app is extremely accessible for a novice, but its capabilities can also suit the needs of fitness maniacs. The $3.99 upgrade is a reasonable price for this excellent, functional fitness iOS app. 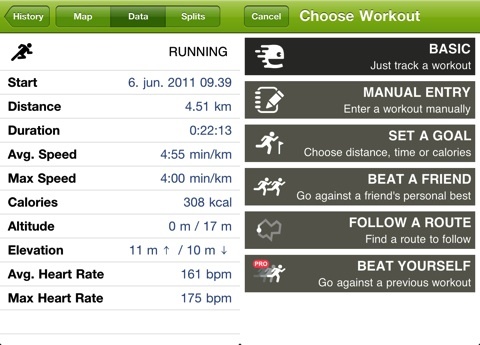 AppSafari review of Endomondo Sports Tracker was written by Jenni Ward on July 2nd, 2012 and categorized under App Store, GPS, Health. Page viewed 6288 times, 2 so far today. Need help on using these apps? Please read the Help Page.